The Filmo 70 was introduced on market in 1923, but my movie camera, model "A", was produced on 16 march 1926: this date is inside. It is equipped with a lens Taylor-Hobson Cooke - Cinema Lens, 1 inch - f:3.5. The housing is black, its weight is kg. 2,150 and the size 72x202x165 mm. It is a historic camera: Bell&Howell was studying to introduce a 17,5mm film, but after Kodak introduced 16mm format, B&H thought to leave 17,5mm, and produced Filmo 70. This machine was lighter, smaller and clockworks-equipped camera on the market. It was a handy camera. The right side has the hole to wind it up, along with a tag that reads "Bell & Howell Company - Standard Cinemachinery". Also on the top you will notice the indicator to show how much film has been used, it is marked up to 100 feet. For 56 years the "70" model mechanism proved itself over and over again in numerous modified versions. The movie camera is gray, and it is kg. 0,620. Its size is 37x126x100 mm. Produced in 1940, this machine was equipped with a lens Lumax 1 inch 1:1.9. 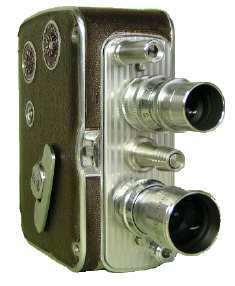 The movie camera is made with brown metal, and with sinthetic leather in brown color. Its weight is kg. 1,175 and its measures are 180x100x45 mm. It works perfectly. The machine works with a 16mm cartridge. Produced in 1947, this machine was equipped with two lenses:aun Super Comat 0,5 inch 1:1.9, and a Taylor-Hobson 1,5 inch 1:1.9. 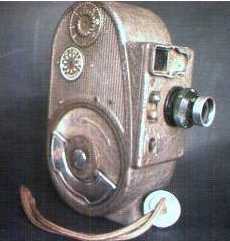 The movie camera is made with gray metal, and with sinthetic leather in brown color. Its weight is kg. 1,150 and its measures are the following. Produced in 1951, this machine was equipped with a turret with two lenses: a Wollensak Raptar 3inches f/2.8 and a Taylor Hobson 1 inch f/1.9. 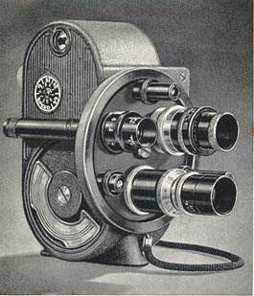 The movie camera is made with metal, and with sinthetic leather in gray color. Its weight is kg. 1,730 and its measures are 248x130x50 mm. 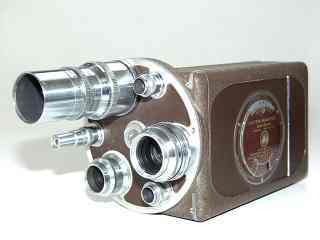 This movie camera was commercialized in 1956. 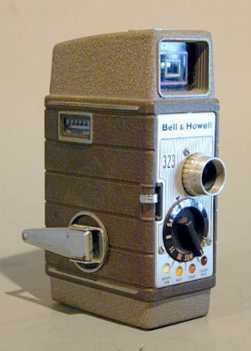 In 1953 la Bell & Howell produced the model "220", a very cheap movie camera. 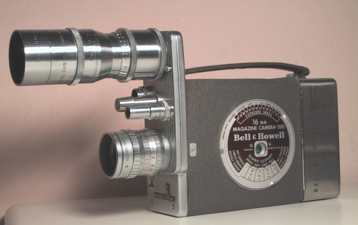 Bell & Howell produced many models, descended from the "220": they had the same structure, only the "number" of the model and some little details changed. My movie camera is equipped with the following lens: Bell & Howell Super Comat 10mm - f:2.3. Is weight is 0,900 kg. its size is 160x70x90 mm. 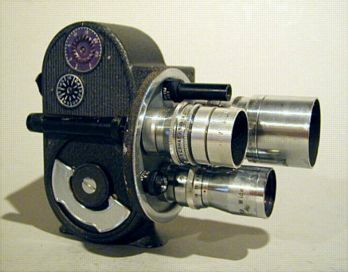 This movie camera was produced between 1939 and 1951. The camera is equipped with a lens Bell & Howell ANATE 12 1/2 mm f3.5. Its colour is gray and the weight is 0,680 kg. ; its size is the following: 75x130x100mm. It is in good conditions and equipped with an original reel. The mechanism is perfect. This movie camera was produced between 1941 and 1950. The camera is equipped with a lens Bell & Howell Lumax 1 inch mm f1.9. The machine is metal, with inserts in brown synthetic leather. The weight is kg. 1,730; its size is the following: 180x130x50mm. It is in good conditions and equipped with an original reel. The mechanism is perfect.